This function provides an interesting variation to normal crossword puzzles in that you are given an empty grid, and a list of words. Your task is to recreate the puzzle by fitting the words back into the grid. It's like building a puzzle from scratch, except that you have only a very small list of words and an assurance that those words will exactly fill the puzzle. 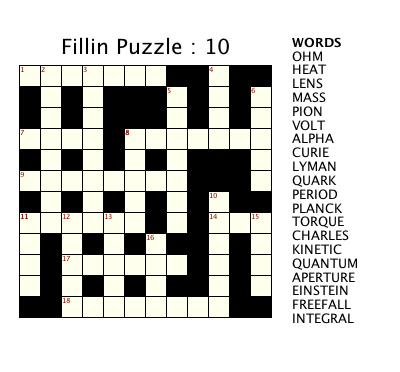 The following graphics show a Fillin puzzle in the Crossword Express Solve screen and a PNG graphic file produced by the program's print function, showing the complete puzzle. See also a full size version of a PDF file showing the complete puzzle. Any crossword puzzle created by Crossword Express can be processed by the Fillin solve function. The solve function contains menus to allow you to Reveal Errors, Reveal One letter, Reveal Solution, and Start Again. 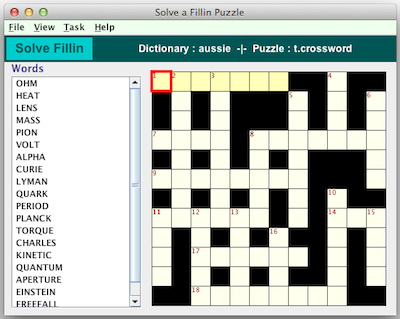 The Fillin print function is also accessible from the Crossword Construction screen. Puzzles can be printed in an unprecedented range of user controlled colors and formats. Output can be sent direct to the printer or, if you install the appropriate software, it can be sent to a PDF file. The recommended software for this purpose is Primo PDF which you can download free from their website, although you might consider sending them a small donation if you find their program useful. Mac users will be able to create a PDF file directly from the screen provided by the printer driver. Individual cells which have been treated using the Colorize Puzzle function of the Crossword Construction screen will be colorized when they are printed by the Fillin print function.